Formerly labeled and marketed by carverequipment.com as First Choice and Farm Trac. Thinking about buying a tiller for your tractor? The tractor's three point hitch serves to connect and raise-lowered a tiller. The tractor's rear PTO (power take off) powers the tillers after they are connected by the PTO shaft. The tiller must be properly sized to the tractor for proper operation and to avoid damages and repairs to both units. Important considerations will include tiller weight, width, lubrication, gear box HP capacity and the length of the PTO shaft. 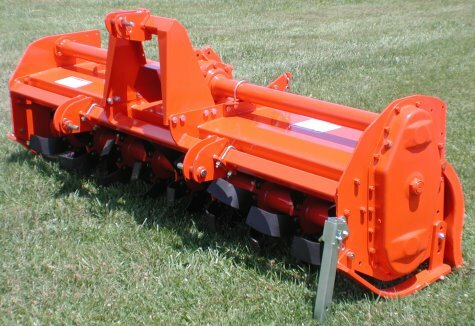 Where can the premier Phoenix - Sicma Tillers be purchased? Right here for you. After 56 years in business, we know how to serve customers with "service that satisfies." CarverEquipment.com is a marketing dba for Fast Forward Services, Inc., Steve Carver, President. In business since May 1959. Just fill in the blanks on our quote request form and we'll send a firm priced - delivered quotation. Why buy Phoenix - Sicma and Farm Maxx Tillers? These tillers have earned the reputation of being the very best valued and quality tillers in the worldwide marketplace for most applications. They have the ultra high standards of quality controls insuring the best workmanship and materials in the market. They are carefully loaded into sealed containers for the overseas shipment. After being unloaded at our distribution center, they are ready to be shipped direct to you. No worries whatsoever. Not only do we keep and huge stock of the various tiller models but a massive supply of tiller blades and other parts at our USA distribution center in eastern North Carolina. We usually ship tiller parts next day via UPS. Larger heavier parts or bundles and crates are shipped via motor freight trucks at very competitive prices. Yes, tillers have a 12 months general warranty and Phoenix 3 years - Farm Maxx 5 years warranty on the gearbox. Of course this only covers non wear items. Click here for a detailed warranty statement. All tiller models offered here (2017) are made at Sicma's Italy plants. All Farm Maxx tiller models offered here are built to Farm Maxx specs and quality controls in India. Yes, you can adjust the tiller about 4" either left or right using the hitch blocks or you can use the sway chains/stabilizers and hitch blocks in combination. Caution: More than 4" will create potential problems with the pto shaft angle however as it is not designed for more than 15 degrees of angle. Yes. One year on base unit, three years on the gear box. Every new tiller includes: 3 pt hitch, Quick hitch compatible, Jack stand, PTO shaft with slip clutch assy. Adjustable side skids to determine working depth, Six each "Curved" blades per flange, Long-life seal for rotor, operator-parts manual. Tillers are shipped with the PTO shaft to our customers on standard 40" x 48" industrial wood pallet and covered with plastic. Some light assembly required to connect the PTO shaft, three point hitch tower frame and jack stand. They are shipped dry as per shipping rules. Before using, add approx. 1 quart 80W/90 gear oil to reservoir. We'll send you an operator/parts manual via email at no charge. These tillers are well suited for all farms, hobby farmers, fruit and vegetable growers, landscapers, nurseries, vineyards, and gardeners. Applications include: soil conditioning weed control, fertilizer incorporation and seedbed preparation. All come standard with slip clutch PTO, adjustable lower links, and heavy duty drag boards. Hi. We have sold hundreds these tillers during the past 25 years. They have been shipped them direct to customers all over the United States and overseas.